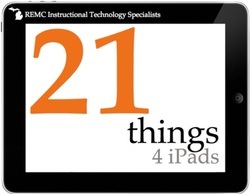 Be sure to visit the 21things4iPads.net site! Explore free apps to ‘strut your stuff’ for students and teachers. Create tutorials or show off your ideas and knowledge using screencasting apps such as Educreations, Puppet Pals2, Comic Book Creation, and Haiku deck. Additional apps will be showcased as well. These tools support curriculum standards in all content areas and are great assessment tools as well. "The Volume Purchase Program allows educational institutions to purchase apps and books in volume and distribute them to students, teachers, administrators, and other employees. The program also allows app developers to offer special pricing for purchases of 20 apps or more." See if an app you are interested in is available through the program by going to http://volume.itunes.apple.com/us/store (note - this link must be open on a computer - when opened from an iOS device, you will be taken directly to iTunes instead of the store.) A school must register to utilize the Apple Volume Purchase Program.